According to Emporis the building was built in 1967 as Brittanic House, a 122m (399ft) headquarters for British Petroleum. An extensive refurbishment, designed by Sheppard Robson International and completed in 2000, increased the floorplates and added height to the top floor. Britannic House was then renamed CityPoint. 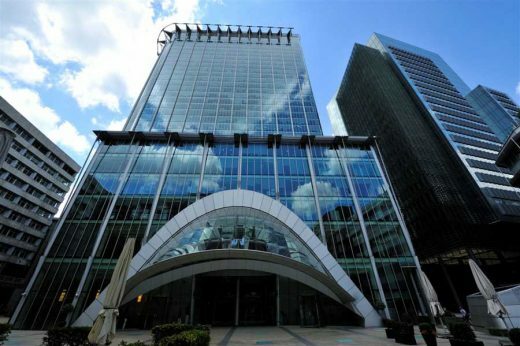 CityPoint is the City of London’s largest commercial office building in terms of rentable floorspace. 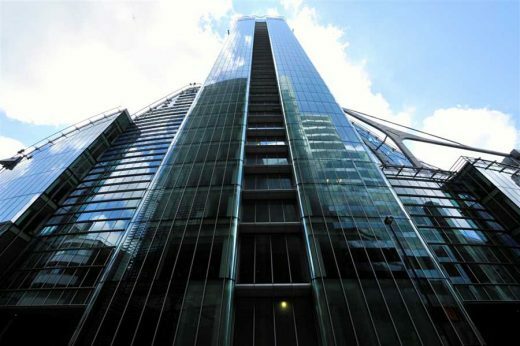 CityPoint was the City of London’s second tallest building upon completion in 2000, but was overtaken in 2002 by the 179.8m (590ft) 30 St Mary Axe. The original design proposed by Santiago Calatrava included an enormous fin on top of the building that would have taken the height to 203m (666ft), but this plan was rejected because of fears it would spoil views of St. Paul’s Cathedral. A tower design by architect Santiago Calatrava for this site was rejected because there were worries the fin on the top would ruin views of St Pauls. This site was occupied by Britannic House which British Petroleum sold to Wates City for £300 million making it the most expensive piece of real estate per acre on the planet.